Here’s the thing: I can’t knit or crochet, but I love crafting with yarn. 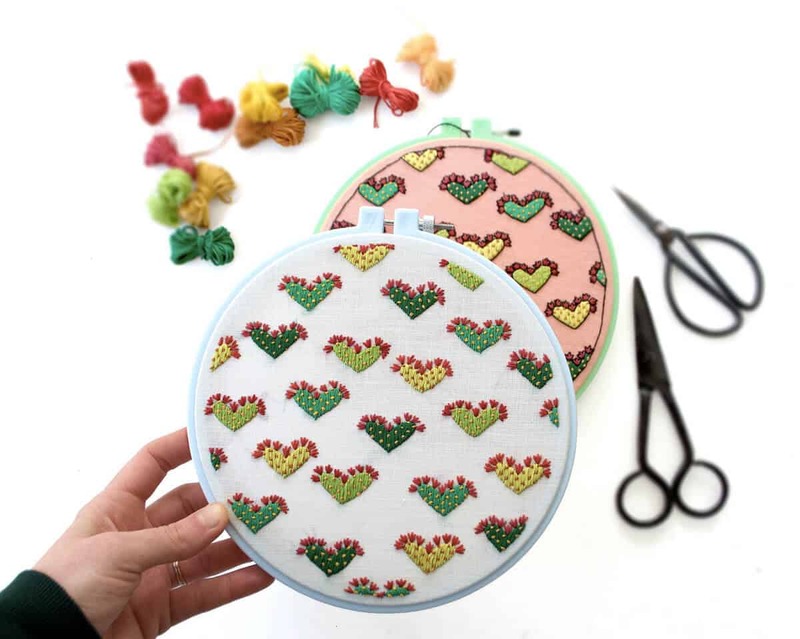 Luckily between pom poms and tassels, you really don’t need to know how to do either of those things to create fun and colorful yarn crafts. 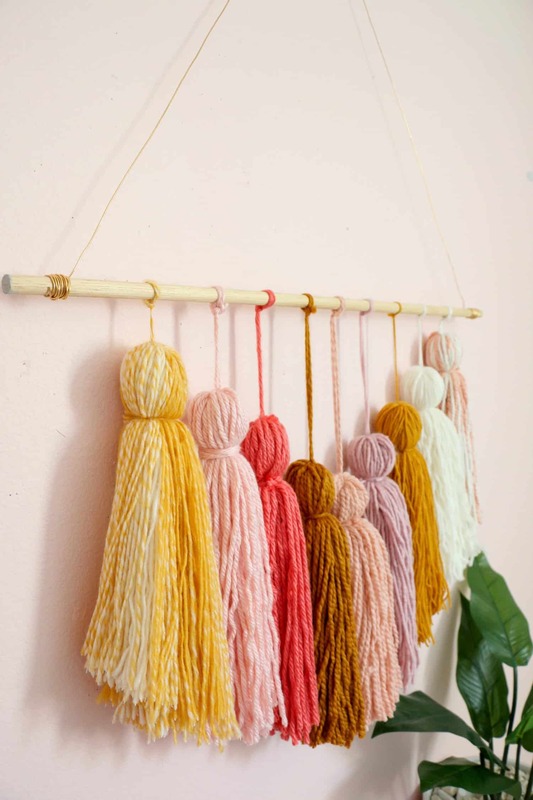 While I have always loved the look of yarn wall hangings, I haven’t ever attempted one. But when I had the idea to create one with giant hanging tassels, I just knew that I had to make it. 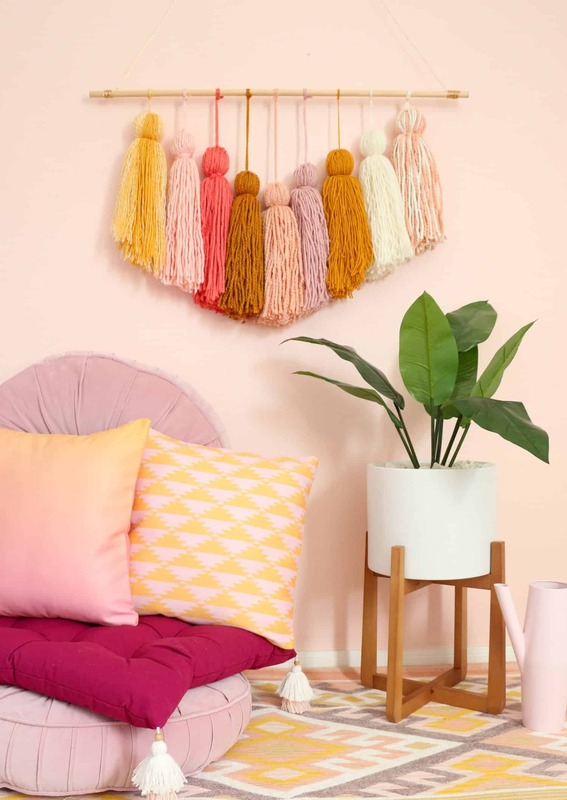 I will say that I was honestly surprised with how quickly this DIY giant tassel wall hanging came together. I think in total it took about 1-2 hours to create, which isn’t bad at all! 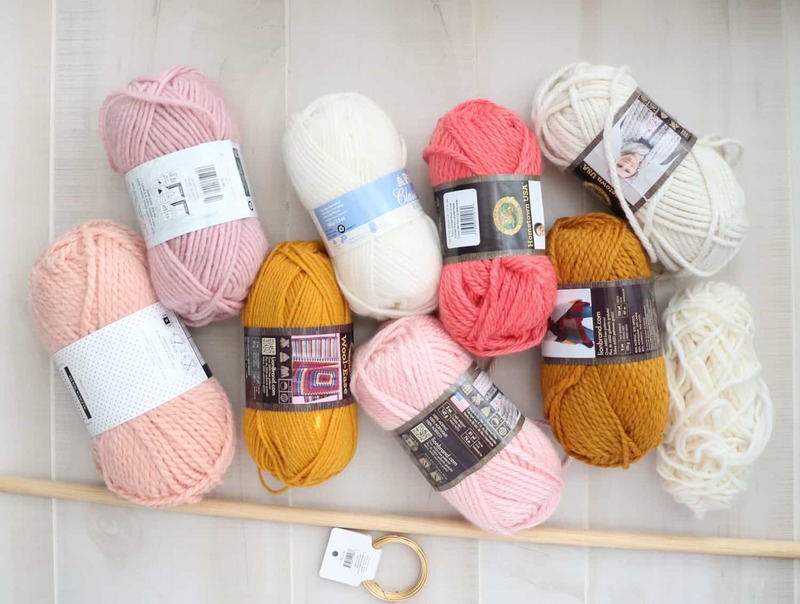 In fact, I think the hardest part is figuring out what colors of yarn to use. Step 1: Begin by wrapping your yarn around the piece of cardboard multiple times until you have used up about 2/3 of your skein of yarn. Then cut the end of the yarn to remove the skein from the yarn wrapped around the cardboard. 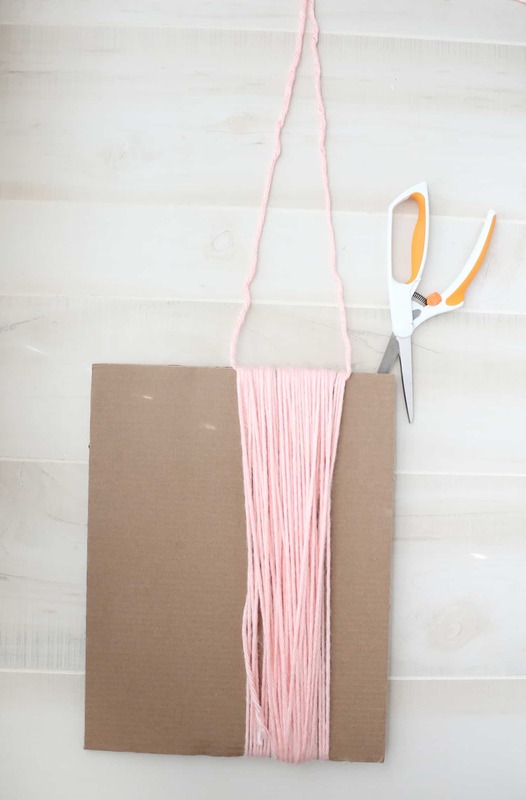 Step 2: Cut a 3′ long piece of yarn and slip it between the yarn and the cardboard on one side and tie tightly around the yarn bundle to gather it together. Then slip the scissors in between the yarn and the cardboard at the bottom of the cardboard and cut the yarn to release the tassel. Step 3: Cut a 12″ long piece of yarn and tie around the yarn bundle about 2″ from the top and knot. 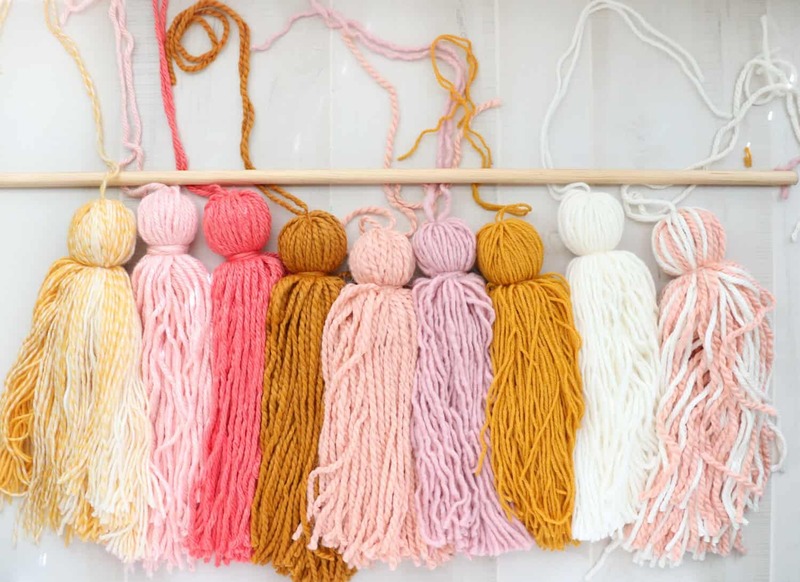 Then repeat with all your colors of yarn to make 9 tassels. 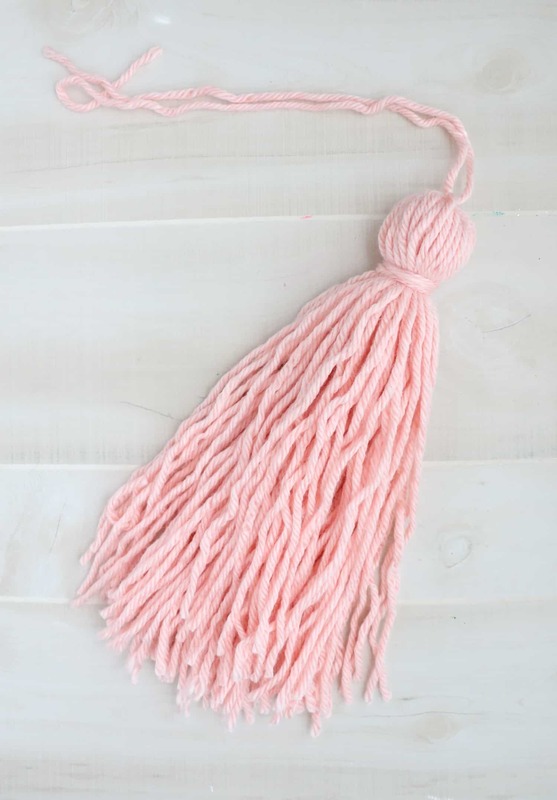 Step 4: Line up your tassels so that the ones on the sides touch the wood dowel and then tapper the tassels down with the middle tassel being the longest. Then tie the yarn top of the tassels to the dowel rod in a knot and trim off any excess yarn. 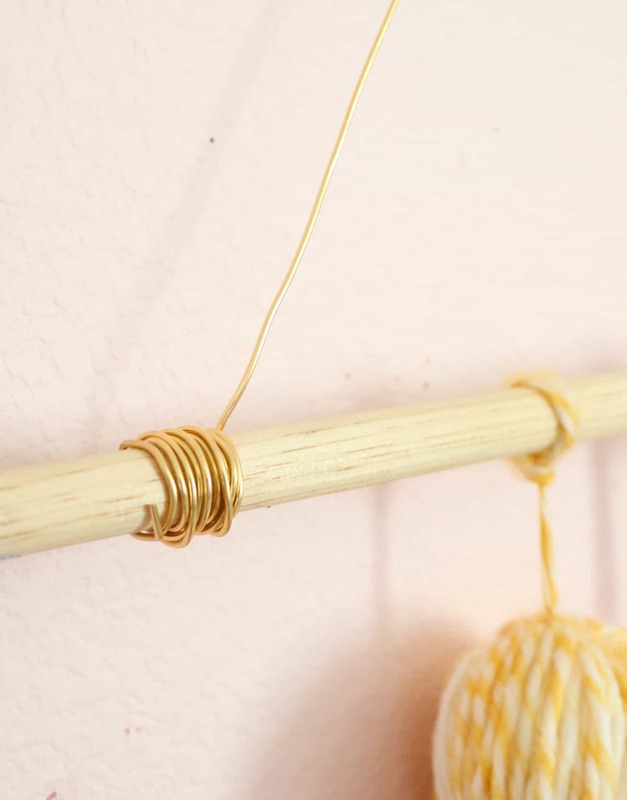 Step 5: Wrap the gold jewelry wire around one end of the dowel rod about 8-10 times and then measure out the amount needed to hang the tassel wall hanging, and wrap the other end of the wire around the other side of the dowel. 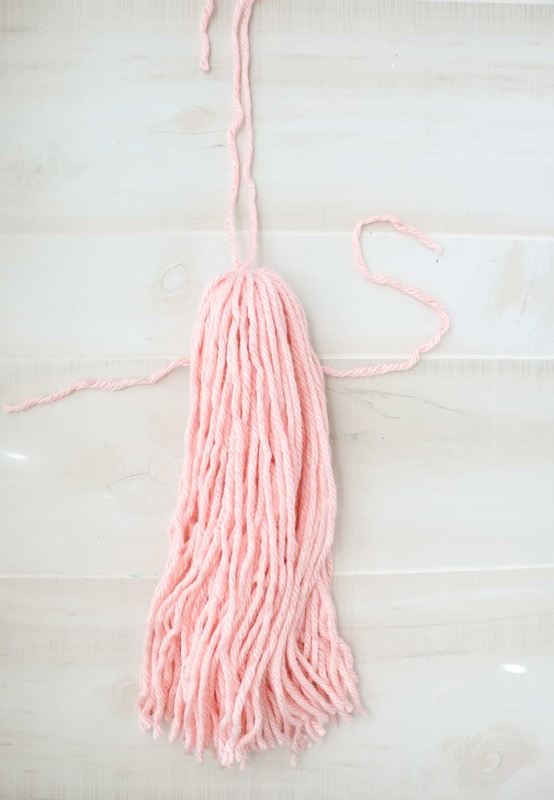 Step 6: The last step is to hang the tassel wall hanging up and use your scissors to trim off the excess yarn to shape the bottom into a V shape. Then your wall hanging is ready to display! 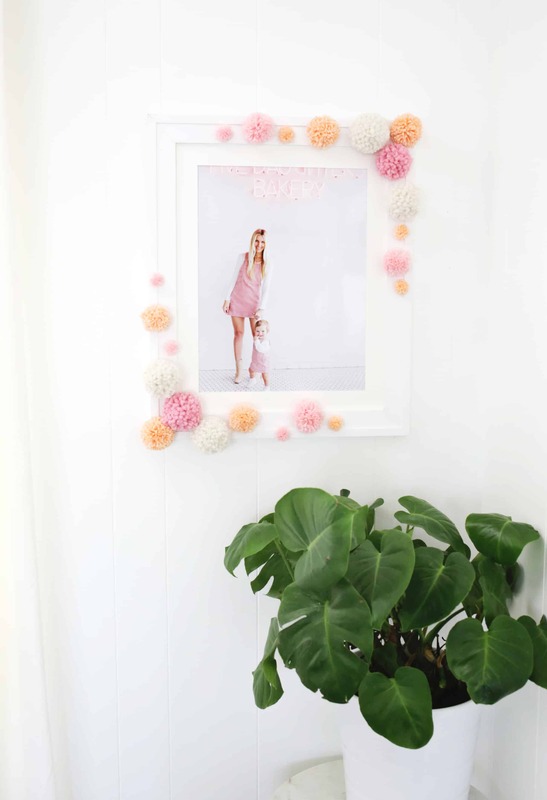 Love the simplicity of this DIY! I need something to go over my bed, and since my hubs is concerned about something falling on him, a knitted thing would be best. Super cute! Oh this is so pretty. Our whole upstairs bedroom is knotty pine we love it but it is dark, we may paint it eventually but as of now we are embracing it. This would be such a simple way to add some color. Will be doing this ASAP!! Thank you! 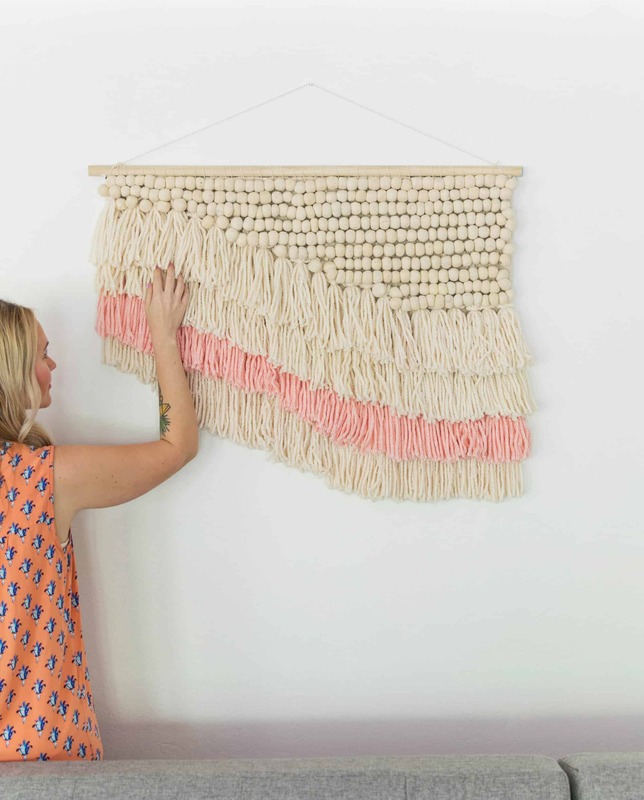 I’ve been straying away from canvas wall decor recently in favor of macrame and texture! I love that I can customize this to my color palette, gorgeous and fun! I’ve felt myself gravitate towards yellow pieces as I’ve been window browsing online. It’s such a warm happy color when not paired with brown like in the 70s, ha! Also pink and yellow together reminds me of lemonade so they work well in my opinion. That looks so cool, I love the colors you chose! This wall hanging is so cute! I totally want to make one for my daughter’s bedroom! Oh my! This is just gorgeous! Perfect in any room. Can’t wait to make it! Thanks guys. 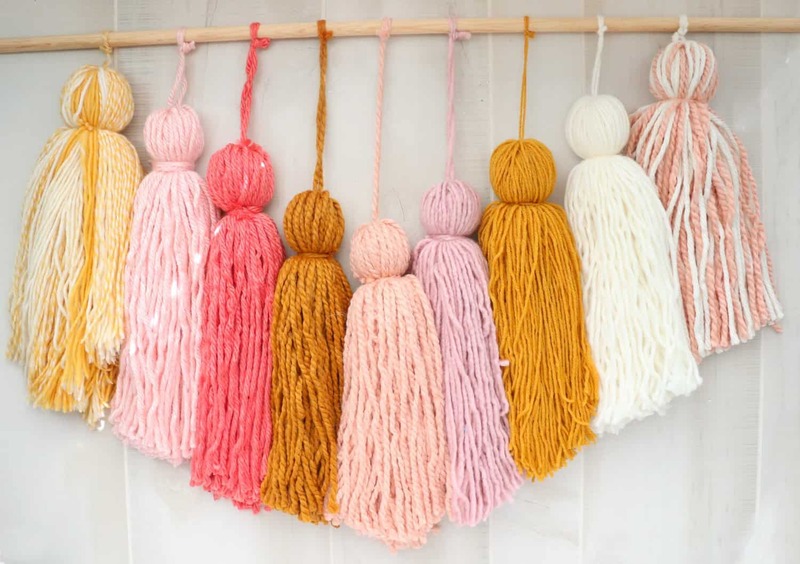 I love these tassels they are gorgeous. I made a set and put them above my bed. I don’t have a headboard so these tassels really decorated my wall. Thank you for the idea. I look forward to seeing more wonderful ideas. This is incredible! I have to try this as a gift for my Mum’s birthday – you may have just made me the best daughter ever! 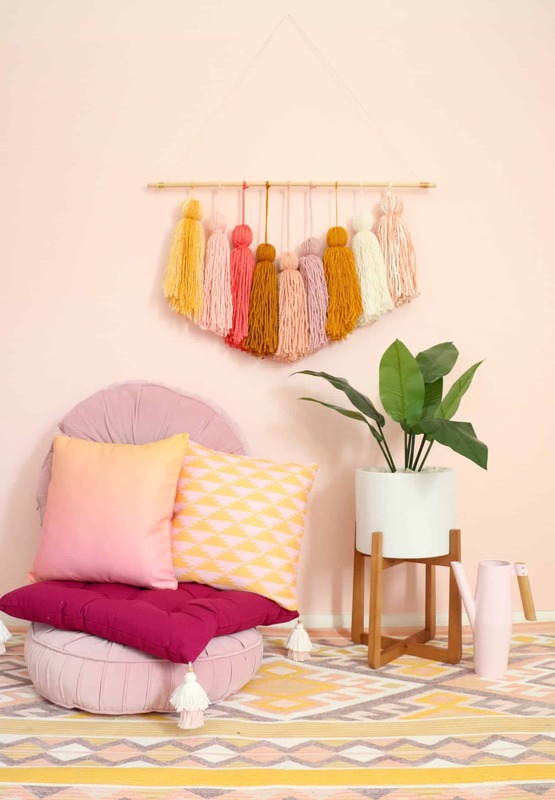 I also love how many colours that you can incorporate into one wall hanging, it looks amazing! These are the nice wall hangings which are looking so much amount of beautiful.